Travel with Kevin and Ruth! : Terrible roads and fantastic scenery!... photos updated! We set off at 8:00am from Etzatlan. We had to head through the outskirts of the big city of Guadalajara in order to take our exit road heading north to Zacatecas. This was going to be a new route for Ruth and I, and of course the rest of the group as well... normally we would take the Mex 54 highway heading north through Aguascalientes... but this time, we were happy to try something new for us. Lots of photos today, but then it was a fairly long day! Rough road heading towards Guadalajara. But then a nice stretch heading north out of the city. And then it became a rough two lane road. 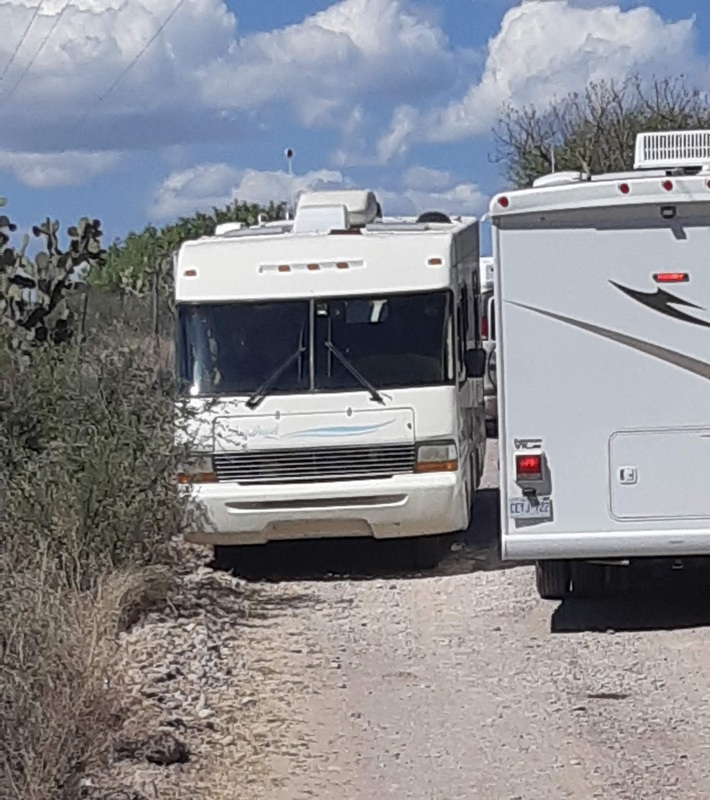 Originally, we had planned on taking the route that goes north through Aguascalientes to Zacatecas, but the RV parking in Aguascalientes isn't suitable for a group. So I found a Parque Aquatico (Water Park) in the middle of nowhere, and along a route that Ruth and I have never taken. Once we got out of the Guadalajara congestion, we made our way north on highway MEX 23. It curves it's way down into a spectacular valley. But it's just a curvy two lane road, and mostly in poor condition. It was slow going, but the fantastic scenery made up for it. We stopped for a half hour lunch around 12:00pm, having done about 175 kms in four hours. We had only taken about a 15 minute bathroom break during that time. Huh? What's that up ahead? The dumb cow just stood there and stared at us. Too funny. We finally made it to the turn off to the Parque Aquatico Las Fuentes. When I did the research, it looked like there were two ways in... a north entrance, and a south entrance. The south entrance would be shorter for us, so I chose that one. There was really no way to know. But, I could see on Google Streetview that the south entrance had a sign pointing to the water park, so I figured that must be it. It was a dirt road, and there were a couple of low hanging branches that we had to cut down. Yep, straight ahead with a group of six RVs! Now we have to get turned around! Eventually, about 3 kms in, the road narrowed and I walked on up ahead to see if we were going to be able to make it. I saw another sign pointing to the water park, and figured we must be close. It turned out that sign said it was another 3.5 kms! Wendy drove on up ahead in her class B van, but said there would be too many low hanging branches. So we gave up. Not fun getting us all turned around, but we did it. It was around this point when I said to the group "well, you wanted to travel with Kevin and Ruth!" In the paperwork I gave them when they signed up, I had said that you need to be able to roll with the punches, and that there would be some adventure on this trip. Well, that's what they got yesterday! It was a little tight getting turned around! This is why smaller is better in Mexico! Just as we were getting ourselves turned around, a young guy (Juan Carlos) drove up on a motorcycle. He said there was a route that would be better for us, and that the buses go in that way. I didn't trust it though, and we were just about ready to give up! He said wait, he would be back in five minutes. Sure enough, he returned quickly, this time wearing a staff t-shirt from the water park. It turned out that he worked there and said he would guide us there if we would follow him! It was another 25 kms (15 miles) to go back around to this other route, but it was worth it. We made it to the water park, and Juan Carlos showed us where to park. Then, he insisted on giving us an enthusiastic tour of the park. I will show you photos in tomorrow's blog post. The place is fantastic! Way out here in the middle of nowhere! It turned out this was Juan Carlos' day off. He just happened by us, and helped us out. What a great guy. I gave him a 100 peso tip. Juan Carlos, leading the way. Sunset at Parque Aquatico Las Fuentes. Everyone made it, safe and sound. Everyone here is super friendly and welcoming. We've decided to stay for two nights, and so today will be water park day for the group! Thursday's drive, 281 kms (174 miles). Lifewit Adjustable Pan Organizer Rack. 50% discount using coupon code CY5GNZYE at checkout. Cool beans you made it. Looking forward to photos. Funny how Mexico is so full of excellent characters - people with good hearts who expect nothing. If only the rest of the world were like that. Mexico as some many amazing people, it is too bad that the media only picks up on the few bad ones. Thanks for the link, Kevin found a better one on the Canadian Snowbird Association's website. Never a sull moment! Very exciting. Juan Carlos was a great help. It’s these kind of adventures that make such great stories. Love it! And a good time was had by all including a great local with a big heart. So awesome!!! As you say, "you've gotta love Mexico"
Definitely! It is unbelievable how everyone is so friendly and helpful here in Mexico. We really wish the media would show the other side of the coin sometimes, but then again good news doesn't sell! What an adventure... terrific.. some day we will maybe hook up and do similar. Can't wait to see the pictures. Patience sure is the key isn't it... so much to enjoy if you can and don't rush ! ! ! The scenery on this particular drive was spectacular. Had we been by ourselves we would have been stopping in several of the towns along the highway and staying for a few days in each one. We can't wait to head back that way again another year.